Leaving town is always a last minute dash for me. No matter how well prepared I think I am, it’s usually an illusion. Something always pops up the day before that needs to be dealt with. Being in business for myself doesn’t help. I make the decisions, do the work, follow up on phone calls and emails etc. It’s all me – and I don’t mean that in an empire building, I rule the world way. I mean that I typically have more to accomplish in any given day than one person can handle. I’ve looked into cloning myself, but with my fear of all things related to needles, I quickly rejected the notion. Ah, the joys of being a small business. When it comes to arranging care for our animals when we are away, we have high standards. We want to find caregivers who will be reliable, compassionate, and willing to follow the routines that we’ve established. The good, the bad and yes, even the ugly. Don’t we all have at least one animal care routine that we’ve started and wish we hadn’t, or at the very least, are slightly embarrassed by? It’s one thing to find someone to take care of Mija. While she does have a stringent set of guidelines for her caregivers, we’ve been fortunate to always find someone who loves cats and is willing to stay at our house and dole out fish flakes and cuddles. Someone who is one hundred percent trustworthy. This is important since they are staying in our home. The horses have presented a larger challenge. This may come as a surprise, but not all horse people are as, shall we say, involved with their horses as we are. Bud and Pepper also have a routine and expectations about how their daily feeding is supposed to go. And then, there’s the rest of the herd of oldsters. Amigo, Red, Baby and Chickadee have been trained to expect hay cubes and other treats. Explaining that to our horse sitters has been a bit tricky. “So you feed all of these horses?” I nod. “Even the ones that aren’t yours?” More nodding. “If you say so.” That’s when I get the smile. The “you must be crazy but I’ll do it” smile. Though I must say, we’ve lucked out with the folks we’ve coerced into going to the pasture and feeding our two old sweeties. They’ve done a great job. Sharing your life with animals is a daily commitment – not one that you can ignore or only tend once in a while. They count on us to provide for them. It’s something I take very seriously. So come on, tell us your crazy animal routines. The ones you have to explain to the pet sitter when you go away. Don’t make me feel like the only crazy animal owner. It’s lonely out here by myself! 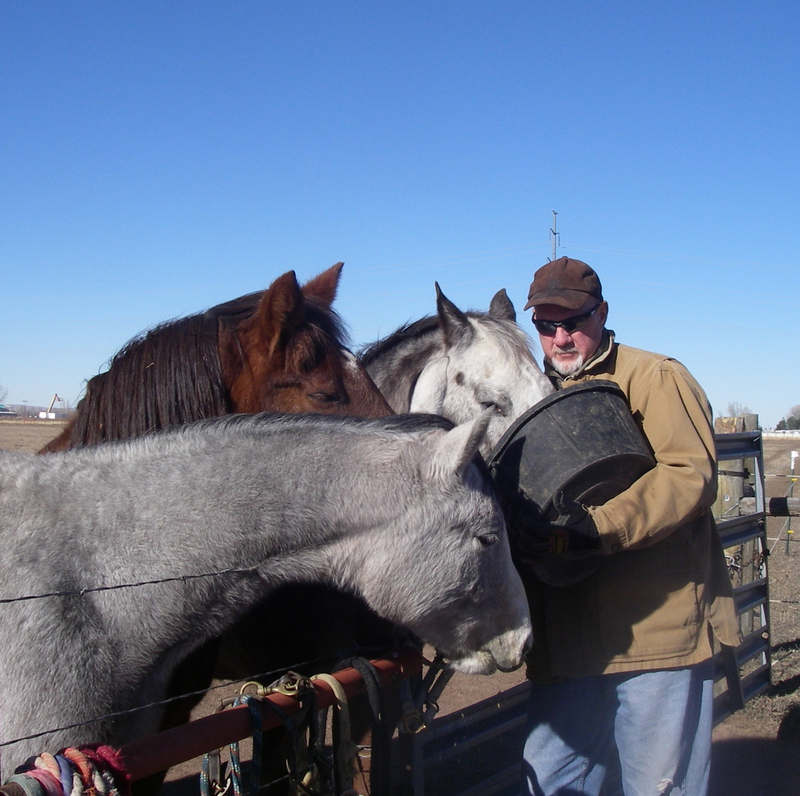 You are so right about animal caregivers, and horse care givers! I wrote a post on Once Upon a Horse about that very thing and the result of a caregiver who did not understand that some horses are time clocks in a horse suit, and that 4pm feeding means 4pm because a horse cannot think to wait til 4:10- and the understanding that irregular schedules result in horses trying to make the best of the situation with a limited horsey brain of no sane resonaing and they always make the wrong choice. Horses that have been dissapointed by schedules and routines often take to milling around the gate, hanging out like school girls who missed the bus…trying to decide if they should skip, sneak a smoke, or jump in the car for a usually prohibited joy ride and ultimately, like most teenage girls, making the wrong peer pressure induced decisions along with giving the ultimate leadership to the wrong peer. In absense of a responsible caregiver showing up on time, the horse always follows Murphys Law. Thanks for dropping by my site. I love your description of horses being time clocks in horse suits. So true! 1. The BIG boys have to be fed at least 50′ apart. 3. The GIRL llamas. There are 27 of them. Try to create 27 piles. And there are a few that are too skinny, and a few that just get special treatment. Here is what you do: while feeding the boys (or the night before), soak a full pan of shredded beet pulp. Then mix this with the llama pellets/sweet mix in 5 different pans. Llady Llyric will come into a stall in the barn by herself and look for her special feed pan. Spicey Secret (she answers to Spicey) will sometime show up, but often heads out with the herd to eat hay. Just call her and she will come running. Shake the pan if you have to, but that sometimes causes more than just her to run up into the barn. Echo (very tall, taupe color with white blaze) will be with the herd, but if you walk out to her and get her attenion (clap your hands), she will follow you back to the barn (maybe – she follows ME). Echo & Llyric can eat theirs together because they eat very slowly. Spicey gobbles and then will steal theirs, so she has to be in a separate stall. AnnaKonda & Bellini will both show up (one all black, one all white) and they get just a little as a treat if they come into a stall. Always clost the doors to the stalls or the entire herd will come in. Be careful with those doors – a few have broken welds (it’s on the long list of farm repairs) on their hinges, so they don’t hang right or close right. Sigh. Thanks Carolann for making all of us feel better about our animal situations :-). I thought Bud and Pepper were picky but your llamas win!! haha. Just trying to make you feel better. Wow, I thought our house was complicated with two squealing dogs and a couple of yowling cats. You guys win!